Fishers Island Electric Corporation History – Fishers Island Utility Co.
1899: Fisher’s Island Electric Light, Heat and Power Co. Unable to meet the increasing demands for power on Fishers Island, the original power plant was turned into a service station and a steel armored submarine cable was laid (13,000 ft. long) to deliver power from Groton to the island. All the properties of the electrical supply system of Fisher’s Island Electric Light, Heat and Power Co. (which had previously been absorbed into the Ferguson’s Fishers Island Farms) were sold to the newly formed “Fishers Island Electric Corporation” in November 1940. Because the Island had been inconvenienced by numerous power outages caused by storms and accidents to the submarine cable, the new Fishers Island Electric Corporation explored the possibility of eliminating dependency on the mainland for power supply. Their solution was to install a local generating plant in the brick building on West Harbor powered by four diesel generating units (Nordbergs), calculating that one could handle the average winter load and that no more than three would be needed for peak summer capacity. The new plant went on line February 9, 1941. In 1962, a new submarine cable was laid between Groton and Fishers Island that ended two decades of locally generated power. The diesel generators were used as a backup system until 2000. Power today is provided by submarine cable with the exception of occasional emergency power provided by a diesel – powered backup generator. The generator is owned by the Connecticut power company but Fishers Island benefits from generating power during peak times which keeps the rates lower. Having an emergency generator on the island also is invaluable in the case of power loss from the mainland. 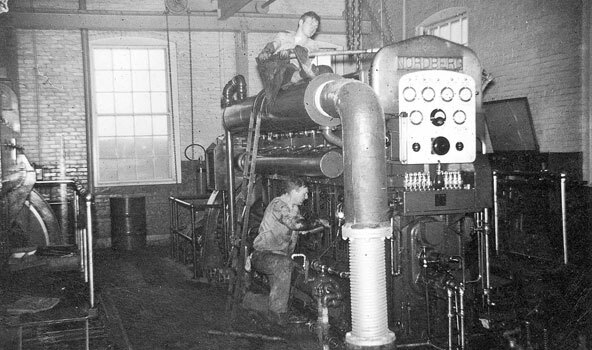 Island Electricity, A Brief History – View photo gallery on The Henry L. Ferguson Museum website.